The land of Mezarim gets hit by a mysterious change in the weather. The temperature drops below freezing. Snow and ice blanket the entire region, and a massive blizzard is on the horizon. The citizens of Ursus fear the worst. Flurry hopes to relax with his friends, but when his sister and another bear cub go missing, panic ensues among the village. Flurry, Noah, and a wolf named Vallidore embark across the frozen land to find answers and save their friends. 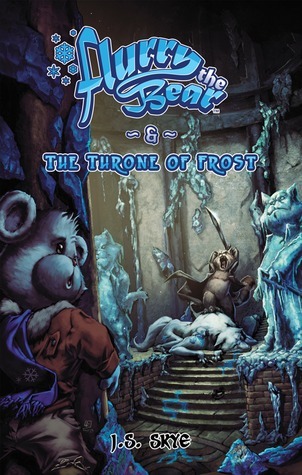 Unbeknownst to Flurry, he will come face-to-face with the evil villain known as Jack Frost. With his polar bear army ready for battle, Jack Frost plans to conquer Flurry’s homeland. Is Flurry outmatched or will he prevail against the most ruthless tyrant his world has ever known? Sometimes it takes a second start for a book to click with you and that was the case for me and this book. When I first picked it up, I just couldn't get into it. I felt as if I was missing something. Well, it turns out that I was! When the author gave me his book to review, he didn't tell me that it was the third book in the series! Oops! Luckily, once you get past the first couple of chapters, you get drawn into the story and the characters quickly become familiar. The story moves at a fast pace, but not so fast that you get left behind. I especially enjoyed that different characters came from different cultures and it showed in the writing. The choice for what kind of critter Jack Frost is surprised me and that's not a bad thing. It was a fun twist for sure. Since reading this book, I discovered that it's #3 in at least a series of 6. That makes the slight cliffhanger/unanswered questions ending a bit easier to handle. If asked if I would recommend this book, I would say absolutely! It's perfect for the upper elementary/middle school set, but I would get books 1 and 2 to start out with. It's just more fun knowing all of the characters and backstory going in! With any luck, the author will send me the rest of the series and we can learn about it together!